If you have a habit of sitting long hours at your desk at work or at home, you may be experiencing some back pains. If you have not felt any pains so far, you're lucky, and you may want to avoid back pains in the future. 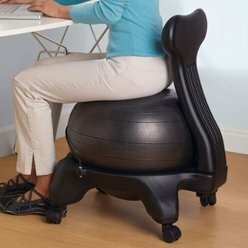 A good an effective way of achieving that might be by using a balance ball chair (see image). If you have never heard of a balanced ball chair, it may sound strange and even look funny. But millions around the world have been using these chairs for quite some time now, and as it can be read in Amazon customer reviews, many users have been very happy with the results. Balance ball chairs turn standard balance balls into comfortable and posture-improving chairs! They provide a different sitting experience than regular chairs by forcing you to sit up straighter. Sitting on a large exercise ball at work or at home promotes flexibility, motor skills, core strengthening, coordination and balance; and in doing so, it is constantly exercising a large group of muscles. 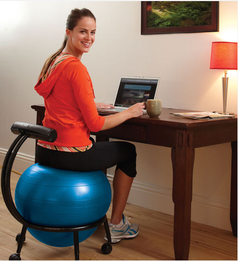 Balance ball chairs allow you to boost your strength, energy levels, and overall bodily health, even while seated. They are viewed by many as an effective tool for strengthening core muscles and improving spinal alignment. Note that if your core muscles may not have gotten much exercise previously, it may take some time before your body becomes accustomed to sitting on an exercise ball. The best way to start is using the chair 10 to 15 minutes a day and gradually increasing the amount of time you sit. When sitting on the ball, the legs should be at a perfect 90 degrees. Needless to say, if you've had back problems or injuries, a physician should be contacted before using a balance ball chair. Note that the balance ball that comes with these chairs is removable and can be used for stretching exercises or as a yoga ball. This article will compare the various types of balanced ball chairs sold by Gaiam, Isokinetics Inc. and Sivan. These were not just the most popular among Amazon customers at the time this article was written, but they had also received good reviews from most Amazon buyers (an average of at least 4 stars each, out of 5 stars!). There are basically three types of balanced ball chairs you can get: those that have no built-in mechanisms for height or back adjustment, those that have only mechanisms for back adjustments, and those that have mechanisms for both height and back adjustments. All three types will be considered in this article. They come with a 52 cm anti-burst ball.Sitting height can be modified by increasing or decreasing the air volume inside the ball. Seat back is fixed and cannot be adjusted. Overall chair dimensions are: (W: 22" x H: 31" x D: 22"), the height (H) being from the floor to the top of the seat back. With a 52 cm (20.5 in) ball, the top of the ball, when not seated, is at about 25" from the floor. But this height also depends on the amount air volume in the ball. They have locking back casters and come with an air pump. The maximum weight they tolerate is 300 lbs. They are designed for people that are from 5' to 5' 11'' tall. Gaiam and Sivan make this type of chair and they are quite identical. They can be found on Amazon and their prices are quite similar (see below for purchase). They come with a 52 cm anti-burst ball. Sitting height can be adjusted by increasing or decreasing the air volume inside the ball. Seat back can be adjusted to a range of positions, from a firm lower back support to a comfortable laid back support. So, you can lean back and relax, or position it on your lower back to provide more support, reinforcing a proper upright position. The seat back adjusts up/down from 32" to 34", measured from the floor to the top of the seat back. Overall chair dimensions are: W: 21" x D: 22" x H: 32"-34" (the height of the chair, measured from the floor to the top of the seat back, can be adjusted from 32" to 34"). With a 52cm (20.5 in) ball, the top of the ball, when not seated, is at about 25" from the floor. But this height also depends on the amount air volume in the ball: ball height can be adjusted by decreasing or increasing the amount of air in the ball. They have locking back casters and come with a small air pump. They come with a 55 cm anti-burst ball. Sitting height can be adjusted by adjusting the air inside the ball or by modifying the leg heights. The legs can be adjusted to 4 different heights. With a 55 cm (21.65 in) ball that is fairly well inflated and the chair adjusted at the lowest leg setting, the top of the ball, when not seated, is at about 22.5" from the floor. At the highest leg setting, the top of the ball is at about 25.5" from the floor. This height can be adjusted by decreasing or increasing the amount of air in the ball or by modifying the leg settings. Back support can also be adjusted slightly for better comfort. There are 4 back support positions. The product description says that the chair is designed for people that are from 5' to 5' 11" tall, but by playing with the 4 leg height settings and the amount of air in the ball, Amazon customers taller than 5' 11" have reported that they were able to use this chair quite comfortably.